Innovation Movement was founded by Zach Gormley and Isaac Sams as an effort to showcase the original, innovative, and artistic aspects of yo-yoing. They believe yo-yoing has more of a capacity for innovation than for correspondence to trick guidelines, and they hope to inspire you to begin to incorporate your own inventive ideas into your own tricks. The core concept of the Innovation Movement is, of course, to innovate; be original and create your own tricks and style instead of just repeating what someone else has done before you. 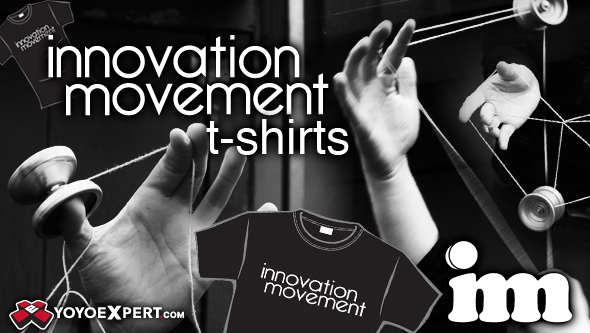 Wearing this custom, american apparel t-shirt shows your support for the Innovation Movement and for the progression of yo-yoing through creativity. The clean printed wordmark on the front and the custom Innovation Movement Logo on the back give this black tee a cool look to fit anyones style. A portion of this sale has been contributed to the innovation movement project. This awesome shirt also comes with 5 custom Innovation Movement logo stickers to help you spread the word and support the movement! Check out their website at InnMovement.com.